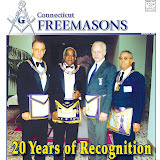 The following article by RW Carl Ek is reprinted from the The Connecticut Freemasons publication, which is running a series of articles celebrating the 20th anniversary of our mutual recognition. Read other articles in this series: 20 Years. 1989 is when it all changed. The state of Connecticut has a not-undeserved reputation for being “the land of steady habits,” populated with staid (some might say “stodgy”), old-fashioned conservatives. But in 1989, Connecticut was on the forefront of the first wave of mutual recognitions between the AF & AM Grand Lodges and their MWPH counterparts. And while it’s true that Oregon made an attempt to recognize PHA lodges in 1890, and Massachusetts made an attempt right after World War II, both states quickly rescinded those decisions in the wake of opposition from other Masonic jurisdictions. It wasn’t until the mid-1980s that the political climate was ripe enough to allow other states to revisit the issue. The following article by RW Carl Ek is reprinted from the January 2009 issue of The Connecticut Freemasons publication, which is running a series of articles celebrating the 20th anniversary of our mutual recognition. “Is there anything further to come before this Grand Lodge session?” The newly installed Grand Master asked the question perfunctorily, almost as though it was a necessary piece of the ritual. The craft – more than 500 uncomfortable, tired brothers, seated in the ballroom of the Park Plaza Hotel in New Haven that day in March 1989 – were sure they knew the answer to that question. They looked forward to the closing of what would surely be recalled as the most rancorous Grand Lodge session in decades, if not ever. The heating and cooling systems of the era were often mutually exclusive, providing either heat or air conditioning, and not easily shifting from one to the other. Less than a week into spring, it was not expected that the outdoor temperature would rise to nearly 80? on March 29. In the ballroom, brothers’ tempers would raise that figure significantly. The year 1989 was already an historic year for Connecticut Masonry. The Grand Lodge had been chartered in 1789 and a New Haven brother installed as the first Grand Master. Thus, New Haven was an appropriate city to host the Grand Lodge kickoff of the bicentennial. Further, the Masonic Charity Foundation was celebrating its centennial, having been incorporated in 1889. There would be much to celebrate in the coming year. To help Masonry grow into its third century, a ‘task force’ had been commissioned to learn what was good and what needed to be changed about the fraternity to make it more relevant, especially for young men who would be desirable prospective members. Consultant Dudley Davis, a non-Mason, was employed to survey Masons and non-Masons alike, distill their thoughts, and offer proposals for change in an organization not noted for embracing that concept. Most Worshipful Grand Master John Gonsalves had the unenviable task of presiding over the session. The task force had presented five recommendations, three of which the voting delegates approved as a package, apparently unanimously, by voice vote. A controversial proposal to change the requirement to reject a candidate for Masonry from one black cube to three was also approved, but only by a one-vote majority. As a by-laws change needed a 2/3 majority, this proposal failed, but showed an amazing degree of open-mindedness among the craft. The ‘leadership’ proposal was the most controversial, and the Grand Master announced that there would be two hours allotted for commentary from the craft before the vote would be taken. He then began calling upon appointed Grand Lodge line officers to read supportive speeches that had been prepared by the task force. The delegates, ready to have their say, remained respectful as RW Bro. Ken Hawkins read his tract. Then RW Bro. Sam Walker took the microphone. By midpoint in the presentation the craft had had enough. They realized that someone had planned to use as much of the debate time as possible by having line officers read “their” remarks, thus allowing little or no time for the lodge delegates to express their positions. This these delegates would not allow. East. Acknowledging the obvious – that the craft would not be excluded from being heard – he asked that the floor be opened for comments. It was clear to even the most enthusiastic backer of the task force’s work that the last proposal would not even reach the slim one vote victory. The work of the day completed, it was time for the concluding events of every Grand Lodge session – the then private installation of the Grand Lodge officers, the roll call of lodges, and closing. For those who had been in the ballroom for more than eight hours, lunch excepted, closing could not come soon enough. MW Past Grand Master Gail L. Smith, 1968, took the Grand East for the unique opportunity of installing his son, Gail N. Smith, as Grand Master for the Bicentennial year. The elder Smith installed his son and the corps of officers with dispatch. The usual presentations of jewels, past and present, followed. Departure would be soon for those occupying the delegate seats. “Is there anything further to come before this Grand Lodge session?” Newly installed Grand Master Gail Nelson Smith paused, silence being the expected response for all but three brothers sitting in that session. The growl thundered from the southeast corner of the all-but deserted dais in the Grand East. Past Grand Master Gail Linnell Smith stalked back to the podium, pulling a crumpled sheet of paper from his pocket as he went. The exhausted brethren were all but beside themselves. What could he possibly need to do now, well past 5:30 p.m.? Gail Linnell Smith needed to change the history of Freemasonry in Connecticut. Brother Smith read a resolution proposing that, with the approval of both Grand Lodges, there be mutual Masonic recognition between the Grand Lodge of Connecticut, A.F. & A.M. and the Grand Lodge, F. & A.M., Prince Hall Affiliates, Inc.